Buy through MusicWeb £10 postage paid. rec. 1-3 13-14 October 2004, Marshall Auditorium, Haverford College, USA; 4 3 December 2003 and 13-14 October 2004, Haverford College, USA and 17 October 2004, Düsseldorf, Germany; 5 25 February, 2006, Patrych Sound Studios, New York City; 6 15 September, 2005, Patrych Sound Studios, New York City; 7 SUNY, Stony Brook, 1990. All texts and translations provided. Should Locker ask a verse from me? (And arm in arm) the shadowy shore. The associations with light verse, and for collaboration with the long dead, are not wholly appropriate for a CD which actually contains some passionate settings of some passionate and profound poems, poems, on the whole very far from light verse, and much of it written by the living. This is a CD which should be of interest to any listener who enjoys modern song, ‘modern’ here implying work within a largely tonal idiom, but with contemporary inflections, work which, broadly speaking, belongs in the distinguished American continuation of the German tradition of lieder. 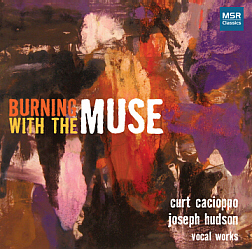 Curt Cacioppo is Professor of Music at Haverford College, Philadelphia; he’s an accomplished pianist (as the first of these CDs would itself be sufficient to demonstrate), whose work as a composer included organ pieces such as Visione delle Crociate (which Hans Fagius premiered in 2002) and the string quartet (his second) Impressioni venexiane (2004), as well as a sizeable repertoire for piano. Of his contributions to the present set, the bulk takes the form of settings of work by contemporary poets, Friedrich Thiel and Christopher Scaife, both of them friends ("arm in arm"?) of the composer. Friedrich Thiel’s seven brief lyrics (the longest consists of sixteen short lines and most are rather briefer) are, for the most part, evocations of melancholy and pain. They win from Cacioppo simple, but eloquent settings, profoundly sympathetic to the imagery and rhythms of the original texts, and Cacioppo’s settings, in turn, benefit from an assured and expressive performance by Michael Riley. The first CD begins with a performance of these settings and ends with a reprise, with the composer’s settings this time interleaved by the poet reading his texts – a nice idea which works well and illuminatingly on a well-filled disc. In between, one of the things we get to hear is Cacioppo’s setting of two poems (‘Poems from Paternina’) by the English poet Christopher Scaife (1900-1988), who will be known to some readers as the author of the text for John Gardner’s 1962 choral composition A Latter Day Athenian Speaks and who published several collections of verse from the 1920s onwards. Scaife’s two poems, in between which appear lines from Adonais, Shelley’s elegy for Keats, are full of images of loss and death, of "ghosts of old desires" and "ashes, in their urn / still loved". (Here one might, indeed, argue for the relevance of Stevenson’s lines alluded to in the album’s title, with their talk of "the shadowy shore"). Again, Cacioppo’s understanding of his texts is very evident, his setting perceptive and sensitive, with a certain anguished aggression giving an edge to the poetry’s language of loss. Soprano Leah Inger, though she gives a committed and competent performance of what is certainly a difficult sing, doesn’t quite manage to sustain some of the slower passages here and is occasionally put under strain by some of the large leaps required of her; she isn’t helped by a slightly over-resonant recorded sound. The booklet notes describe ‘Franciscan Prayer’ as a scena pastorale, which is fair enough. In it Cacioppo sets the familiar prayer of St. Francis (English readers may remember its abuse by Margaret Thatcher), for voice and piano, with offstage trumpet and percussion (chimes, suspended cymbal, Tibetan monastery bell); it is perhaps the least fully convincing of Cacioppo’s works to be heard here; the simplicity of the means employed makes it rather less than memorable some of the other pieces, and I wasn’t convinced that the setting did very much to enhance the words, although its close has a pleasing poise and quiet power. Overall, however, this is a valuable opportunity to hear one aspect of the work of an interesting American composer, work not otherwise readily accessible this side of the Atlantic. The same can be said for the music of New York composer Joseph Hudson. Certainly there is no kind of ‘light verse’ to be heard in his settings of Rilke and Dylan Thomas (‘I have longed to move away’) and even the three Campion songs ("So tyr’d are all my thoughts", "When to her lute Corinna sings" and "Rose-Cheekt Lawra, come") have more to offer than the sort of refinement claimed by the title Lyra Elegantiarum which Locker Lampson gave to an anthology "of some of the best specimens of vers de société and vers d’occasion" which he published in 1867. Rilke, represented here by ‘Einsamkeit’, ‘Eingang’, ‘Klage’ and ‘Herbst’, is about as far removed from such social verse as might very well be imagined. Rilke’s own verse approaches the quality of music, in the way it communicates, more than most poetry does. Rilke himself didn’t much approve of musical settings of his work; but it lends itself beautifully to sensitive setting – as demonstrated by, amongst many others, Schoenberg, Hindemith, Paul von Klenau, Frank Martin, Bernstein, Knussen, Lauridsen, Rolf Wallin, George Perl and Peter Lieberson. Hudson, then, is keeping formidable company and, while I wouldn’t put these four settings at the very head of any league table of Rilke settings, his work deserves respect for the seriousness and intelligence with which it responds to Rilke’s words. Melodic phrases and piano accompaniment are unflashy but responsive to word and implication; there is some minor, apt word-painting, but never in the service of an over-literal response to the text and the loosely tonal harmonies are well-judged to evoke Rilke’s ambiguous atmospheres. Elizabeth Farnum gives an assured, nicely pointed performance, articulating the unforced rhetoric of both words and music very convincingly. She is very ably complemented by Margaret Kampmeier at the piano. Ever perfect, ever in themselves eternall. Were there but world enough and time, it would be fascinating to compare Campion the composer’s treatment of his own words with their treatment at the hands of Joseph Hudson. But it has to suffice simply to say that Hudson comprehensively escapes the temptations of Elizabethan pastiche, without ever making one feel that he is straining after mere stylistic difference. He creates a quite un-Campion-like idiom which is yet thoroughly convincing. Some musical threads run through the three songs, very much conceived of as a sequence, in which Hudson treats Campion’s words and sentiments with all the seriousness they deserve (he’s still an underrated poet). Initially disturbed and pained, Hudon’s music moves through to a fitly radiant and affirmative conclusion. A set of songs I was delighted to discover, and one to which I shall certainly return with some frequency. The programme ends with Hudson’s setting of Dylan Thomas’s ‘I have longed to move away’, a 1933 draft of which can be found in one of Thomas’s notebooks and which was first published in the periodical New Verse in 1935. Again Hudson finds a persuasive musical idiom which responds to the text, and the use of tenor and string quartet allows for some attractive variety of musical texture. Hudson was a new name to me, and it is one which, on the strength of his contribution to this pair of CDs, shall certainly look out for in future.